*What is our Lowest Price Promise? – Okie Bail will match any quote for bail in Muskogee or northeast Oklahoma. It’s that simple. For the lowest price bail, contact Cassandra Mounger at Okie Bail Bonds today. Read this helpful article and find out more about how bail bonds amounts are determined. How is bail calculated? Okie Bail offers a guaranteed Lowest Price Promise. If you think you’ve found a lower fee for your Muskogee Bail Bond, call Cassandra Mounger. We will match any bail bond quote in Oklahoma and will ALWAYS provide the best bail bond service. 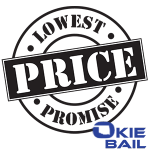 *Our Lowest Price Promise means we will guarantee the best quote for any bond no matter the size.